By now you must know we’re into beer (and bikes), coming from Seattle, where all the good stuff is made. But there’s wine in our neighborhood too and just as many wineries as breweries. Seattle Urban Wineries is a group of over 20 award winning artisan wineries in the city. And, we’ve started visiting them for tasting on weekends riding to them on our city bikes. 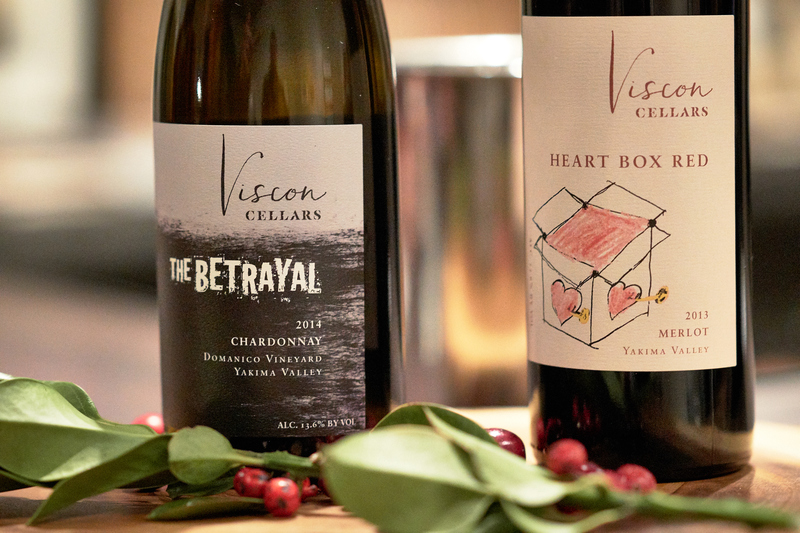 At Viscon cellars, we tasted their holiday wine releases, listened to what the winemaker had to say about the vintages, and shared our tasting notes below. Already sold out, the Betrayal is made from some of the oldest Chardonnay vines in Washington State. The grapes came from Domanico Vineyards in Prosser Washington. That’s a small family owned vineyard that has been yielding premium wines in Washington since the mid 1970’s. The name “The Betrayal” comes from the winemaker’s desire to make a Chardonnay that can honor its place of origin while bringing out the best from this varietal by utilizing winemaking techniques that would coax out the beautiful flavors and finish. So it’s not really a Chardonay. And, agreed because 2013 was a very good wine growing year with long warm days and cool nights. Those conditions allowed the flavors to develop slowly in these grapes. Hand harvesting and whole-cluster pressing the grapes minimized handling for even more flavor and the juice was fermented in stainless steel tanks then transferred to 100% new French oak barrels for secondary fermentation and extended aging for 14 months. The result is far less a betrayal but a triumph in a wine that shimmers with beautiful golden straw color and scents of warm apricot and cantaloupe. Flavors are warm and creamy with hints of baked apples and graham crackers, and a smooth tropical fruit finish. Heart Box Red was named after the winemaker’s oldest daughter’s practice of catching and locking kisses in her “heart box” so she could take the kisses out whenever she needed one. The label when designed she was 3 years old has been an icon of the heart box wine ever since. Like their daughter, the wine is young and delightful. It’s a blend of 96% Merlot, blended with 2% Cabernet Sauvignon and 2% Cabernet Franc, all from Alder Ridge Vineyard in the Yakima Valley. The 2012 vintage was aged for 24 months in 25% new American Oak barrels and 75% once-used French Oak barrels. As you can see in the photo, the deep red color glistens with long legs on the glass with a swirl, that leads to ripe berries and a whiff of vanilla. Black cherries were present and are complimented by subtle mocha flavors. This wine is more tanniny than we prefer, but the “heart” put into it shows. It finishes with a velvety-light toast taste. This wine tasting story appeared in Issue 42 Digest and it’s available now on iTunes and the Web for $4.00 an issue or $16.00 per year.